The development of shaping technology, which may involve the use of an automatic system with software control and a set of special tools, makes it possible to aspherize large off-axis optical elements of astronomical and space-based telescopes in which the deviation from the nearest sphere is greater than 1 mm. 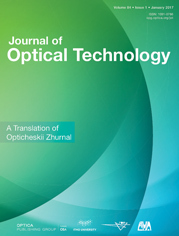 This paper discusses an example of the automatic shaping of an off-axis mirror 560 mm in diameter with asphericity 200 μm in which the surface shape is monitored with a diffraction optical element. A method is considered for preliminary aspherization of an off-axis segment of a composite mirror 1520 mm in diameter, involving the elastic deformation of a segment, followed by automatic finishing. The paper presents the results of aspherization for the Millimetron telescope project, using automatic milling, grinding, and polishing of convex off-axis elements made from Astrositall with more than 1 mm asphericity.